True to its name, the Sequoia is a rustic but elegant ranch-style home. 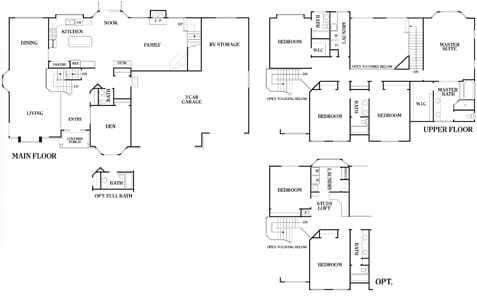 The house plan occupies a total of 5,073 feet, while the enclosed interiors will occupy 3,344 square feet once finished. The upper floor is designed for economy of movement, with an evenly spaced master’s bedroom, 3 additional bedrooms, and bathroom. The lower floor features an integrated living and dining room, an island kitchen with a nook and casual family dining area, a shared bath, a den, and an ample three-car garage that can house a recreational vehicle (RV). Building a home as exquisite as the Sequoia need not be burdensome to Utah families. At Perry Homes Utah, this is what we believe, and we’ve worked to realize these family visions during our 40 years in the home construction business. We’re known to employ top-tier construction at affordable rates. Moreover, we want to make sure that each house is built to accommodate the lifestyle of the homeowner. That’s why we’ll assign you a design specialist who will help you customize your home, and we’ll put our customer service team on top of all your queries—even at the post-construction phase. Contact Perry Homes today about the house plan for the Sequioa. Give us a call at 801-264-8800 so we can start designing and building your Utah home.